Valentine’s Day is a perfect holiday. A celebration of love & friendship marked with paper hearts, cards, sweet treats, cupids & flowers. 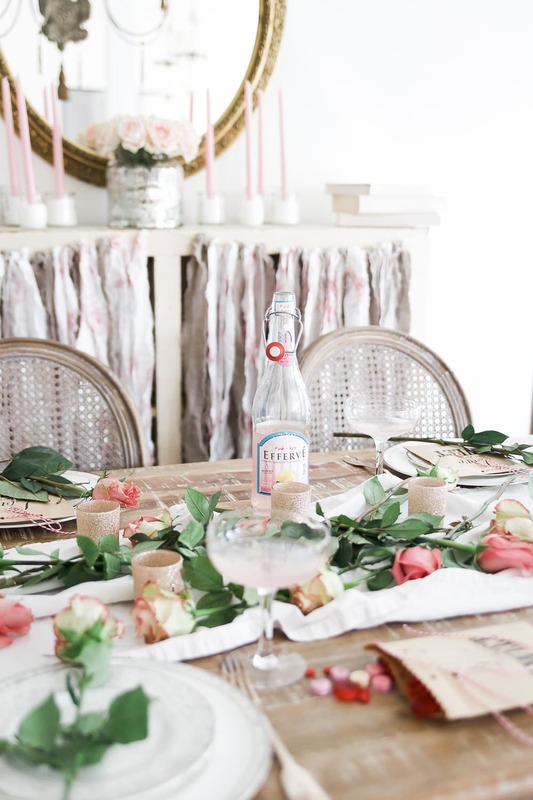 Today I am part of the Styled & Set Valentine’s Day Tour organized by Lory of Designthusiasm. If you are following along and have come over from Blesser’ House or any of the other blogs ~ welcome! I hope you are enjoying the tour. If you started the tour here, all the wonderful posts are linked at the bottom. Valentine’s Day is a perfect time to make a bit of a fuss over those we adore. I suggest making a special fuss over the ones who are usually the fuss’ers not the fuss’es . The special women in your life who make the other 364 days special for their people. Treat them to a few hours in each others company, at a lovely table, with decadent treats & maybe even some champagne. Time in the company of my friends always leaves me feeling renewed. Laughter, shared stories and advice flying around the table acts like fuel to refill my tank. I bet you feel the same way. The years fly by too quickly not to sometimes just stop the bustle and connect with those we love. That’s to my mind what Valentine’s day is all about. 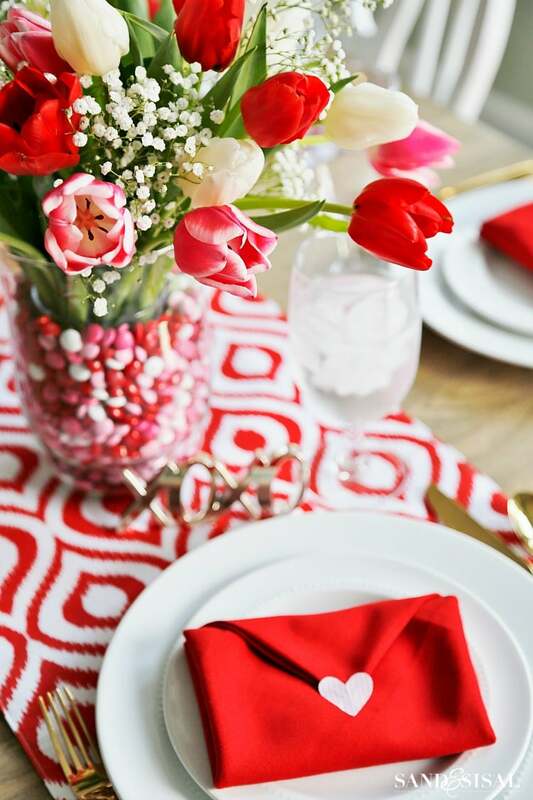 If you agree and want to set a special table to celebrate Valentine’s Day with friends I have some suggestions for you. Make it over the top feminine…its just the girls so why not?! Mix and match hand painted plates, estate sale tea cups and layer on the florals. Use the colors of the day pinks & reds as pops. I laid a bright pink ribbon down the center of my pale yellow striped grain sack runner and used pink flowers & plates painted with pink florals for just enough sweetness. A note on the centerpiece make it lush, but make it low so everyone can see each other. I created mine in a trio of vessels all corralled on a vintage dressing table mirrored tray. As I love the mash up of rustic & refined I prefer a runner so the rough hewn table bumps up against the crystal & china. Get yourself a set of gold flatware for just these types of special occasions. The gold makes the place settings say “this is not everyday”! Have the gathering start at an off time like 11 or 4 ~ brunch or tea time. Chances are your guests will be less in demand by their usual suspects at those times of day. 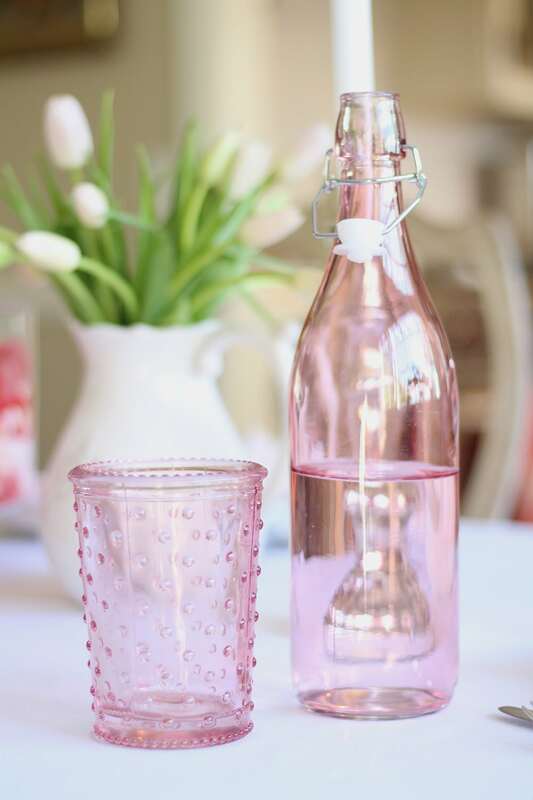 Serve tea sure, but have some bubbly or Rose’ on hand too. Regardless of the time use candles. You will have more to talk about then time to talk, but it would be fun to add to the table something Valentine-y. Maybe a book of classic love poems. Even better than love poems, I placed a pile of old love letters I found at an estate sale. They are tied with string, fragile and yellowed, but definitely read-able. See them in the upper right corner of the table? My Valentine wish for you is that you can find the time connect with those you love. You have plenty of time to make plans to do just that…and once you are done visiting all the blogs on this beautiful tour you will have so many ideas on how to celebrate you’ll be readier than Cupid himself! Thanks for coming by today. 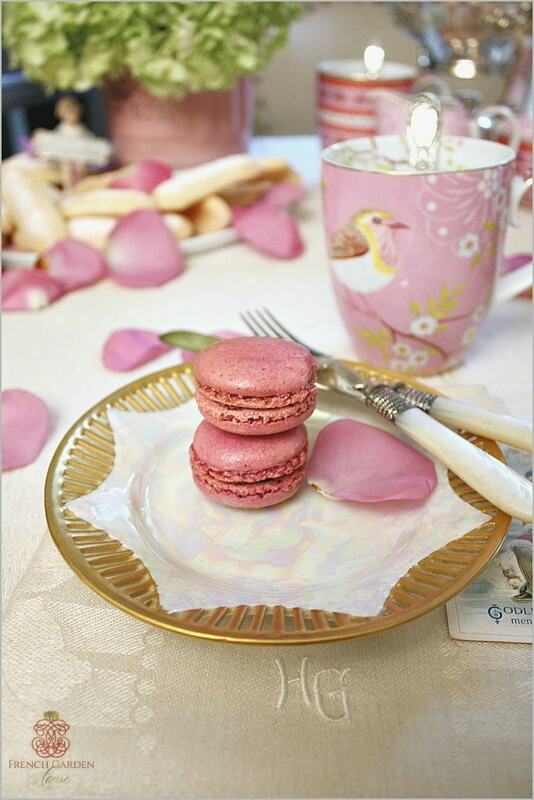 Now head on over to the other blogs for more Valentine inspiration. The tour will last all week, so pop back over so you can get the rest of the links. I will be updating them daily. I don’t want you to miss a thing! 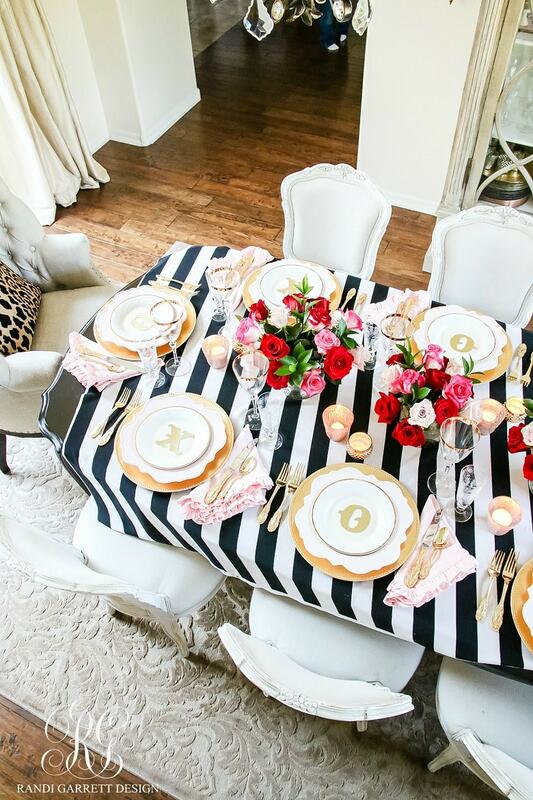 A most sweet and beautiful table to share with friends!….yes, Valentine’s Day is all about being with the ones you love…friends and family! Thanks for coming by Shirley! What do you & your sweet hubby have planned? This is so so sweet; I love every detail! Those dishes- omg! Thanks Kelley!! Yes had been collecting handpainted floral dishes for a loong time just b/c. I had them in a cupboard. Then I broke ’em all out for a wall in my daughters then pink & peacock blue room. She is now into neutrals too, so away they went. It was fun to see them again on this girl-y table! Love this romantic table! And those dishes are just amazing! Love! Many thx Tamara! I do love these plates too. A bit of glam as you like it Heather! Thanks for coming by! I just enjoyed your Victorian home tour as well as the wonderful Valentine’s Day decor. Thank you so much for all the great pictures and ideas. I wanted to ask about the beautiful wreath that is hanging on your dining room door in the Victorian tour. Did you purchase it or is it a DIY project? I subscribed to your blog and am looking forward to reading it all the time! Kelly, I think you have everything on this table that I absolutely love! 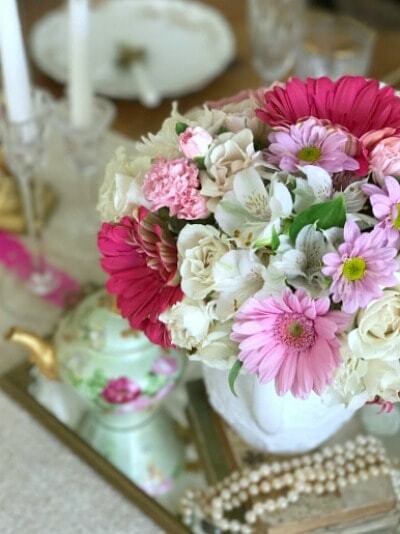 The mix of vintage plates is so charming and every accent pieces perfectly chosen. The poems, the wine caddy, the gold flatware, and the flutes – all are beautiful! I also love the idea of spending a day with the girls… 🙂 So pretty and feminine and utterly delightful! What a beautiful table you’ve set!! So romantic and inspiring!! I love the idea of all different plates with the floral common theme! So sweet!! I love your chandelier and I am looking for one for my kitchen, would you mind letting me know where did you purchase it form? Thanks!! Hi Cristina – thank you for coming by! I found my chandelier at an estate sale. It was in pretty good condition and you could see the sparkle thru the years of dust. After a rewire & thorough cleaning she shines bright. I believe it to be a Maria Theresa style and it boosts 19 lights. If you want a vintage one you could start on Etsy or Craigslist. Good luck! Love the vintage styling and mix of dishes! So romantic and pretty, Kelly! Thanks so much Jennifer. It was fun to get all girlie! What a sweet idea Kelly! Love it and it’s definitely not too girly…it’s perfect!